Style Roundup | Oh, hello thirty. There are some cities that just get under your skin. While I certainly love NYC, I also absolutely adore Chicago. My best friend from college relocated to the city nearly a decade ago and I’ve been a frequent visitor ever since. I love the distinct neighborhoods, the laid back vibe and the boutique shopping. Lucky for me, my girl Alyssa is a fabulous personal stylist and knows every great store in the city. 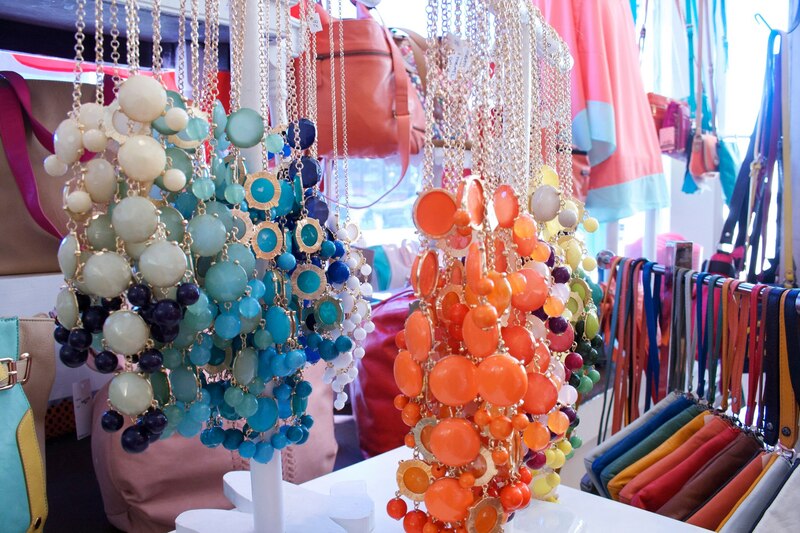 Today Alyssa introduced me to a new favorite – M2 Boutique in Lakeview. I’m in the Windy City for a work conference and was looking for a funky necklace to jazz up my oh-so-professional – but sort of boring – black wrap dress. This morning I stole a necklace from Lyssa’s collection, this evening she took me to find one (or, erm, three) of my own. M2 is my kind of store. It’s bright, playful and has an excellent selection of fun, on-trend accessories. Best of all everything is reasonably priced. I walked out of there with three funky necklaces for under $90. Take that JCrew. (I’m sorry JC – you know I love you – but really, $90 for a costume-jewelry necklace? At the outlet? No thanks.) Thanks to Alyssa’s stylings and M2’s selection my work wardrobe just got a little funkier. Gotta love that. I love the Lucy Sculpted Coat. It’s longer than most sweatshirts so it covers my bum. I still believe leggings really aren’t pants, so I appreciate the extra coverage. It also features deep pockets. I can carry my cellphone, my home phone and some lip balm in those babies! (And yes, I may look a little ridiculous). One of my favorite things about Lucy is that they run great sales, in fact this lovely is currently marked down. The classic Lulu Scuba hoodie was one of the first “upscale” sweatshirts I owned. I have a purple version that I’ve been wearing for years and thanks to one of my good friends I am the proud new owner of an aqua version straight from the insane Lulu warehouse sale. I’m curious about this new stretchy version. Can’t wait to try it! I was recently introduced to the Zella Galaxy hoodies. The fit is similar to the classic scuba, the fleece is cozy and the price is great. I adore my grape version and wouldn’t mind owning several other colors as well. I recommend ordering a size up, the fit tends to be a bit snug. It looks like they are currently out of stock online but keep an eye out at Nordstrom’s for good deals on the sales racks! Style Roundup: In which I try to like color blocking. Colorblocking seems to be one of those trends that never really goes away. I guess that’s fine, but I generally find it pretty boring. Every time one of the designers on Project Runway (Mila, I’m looking at you) starts gushing about color blocking, I fast forward. That said, I found this BCBG dress online over the weekend and am coming around a bit. Admittedly, my affection for this dress is 99% attributable to my love of navy and yellow. But still, I feel like I am making progress. And these shoes from C.Wonder? Delightfully old lady. And, I love this chevron striped sweater. I generally don’t wear chunky jewelry, but I really like this bracelet Oliver Bonas. Conclusion? My problem with color blocking may just be a problem with people talking about color blocking. Necklaces shaped like states (as well as anything shaped like states, really) have been on the scene for a while now. 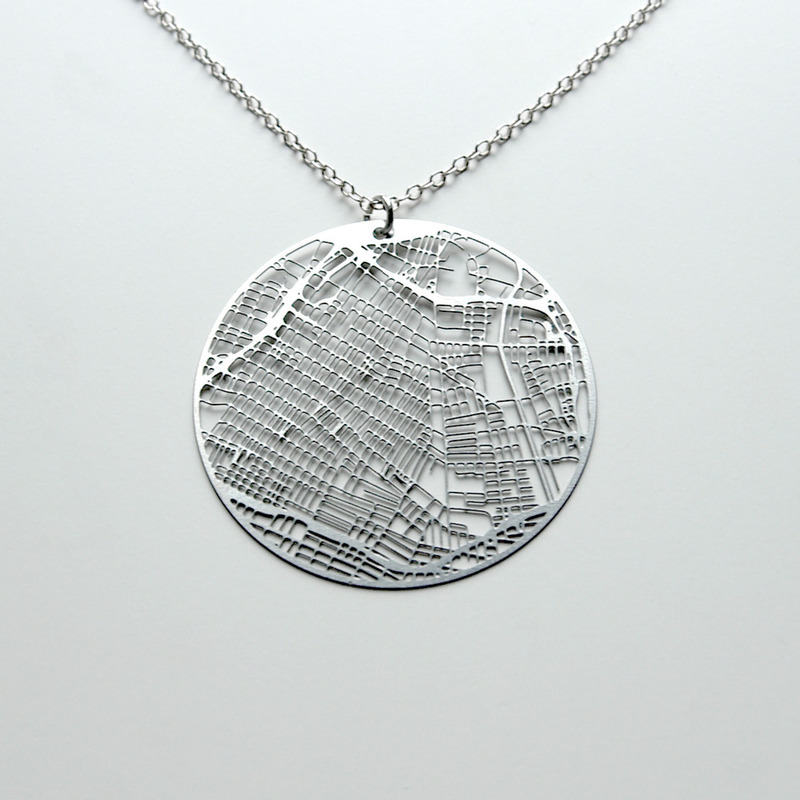 And while I still love both of my South Dakota necklaces, lately I’ve been on the lookout for accessories that convey a sense of place without being quite so literal. 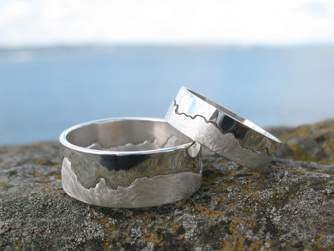 These coastline rings from Hannah Louise Lamb are the perfect example. Customers choose a section of coastline and its outline is then hand-etched onto the ring. Customers are also given choices of metal and width. The rings are gorgeous and could even stand in as unique weddings bands. Lamb’s online store also offers personalized cuff links and brooches. 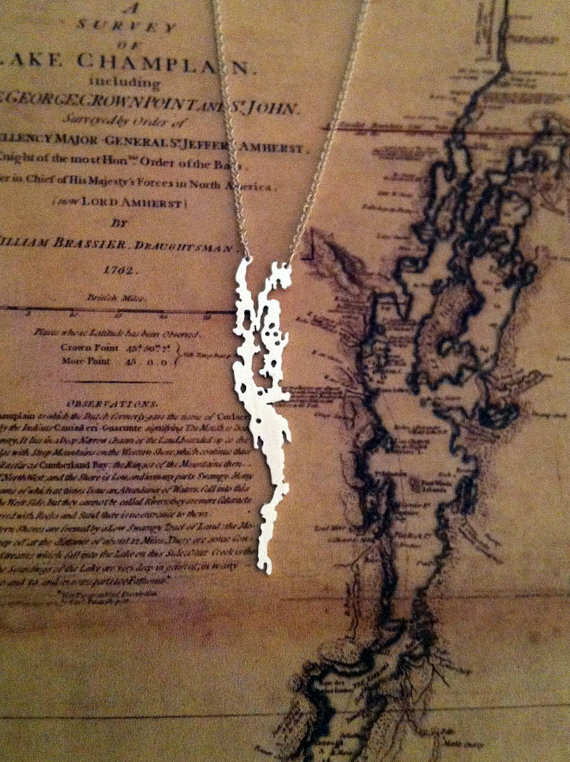 Sara Pfau’s you are here store on Etsy offers similarly sentimental options for fans of lakes and islands of the Northeastern states, including this delicately awesome version of Lake Champlain. 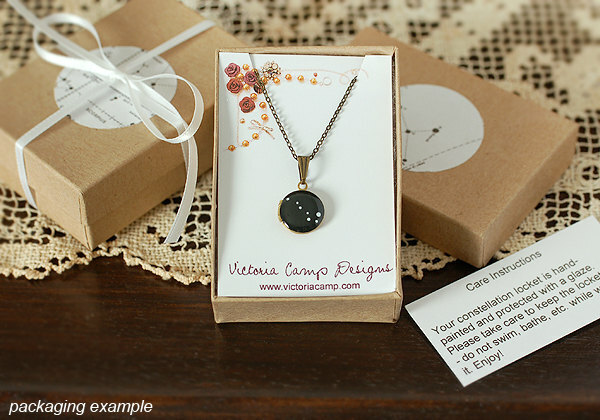 This year, for Christmas, my mom bought me a constellation necklace from Victoria Camp Designs that features Ursa Major (the Big Dipper). I love it both for its simplicity and because the big dipper is the first constellation my mom showed me how to find in the night sky. Etsy has a lot of different options for constellation necklaces so it’s worth doing some searching. That said, I’ve been very happy with mine and Camp’s prices really can’t be beat. I’ve been a subway commuter in three different cities over the past decade and I know the affinity that develops over countless hours shuttling from home to work. 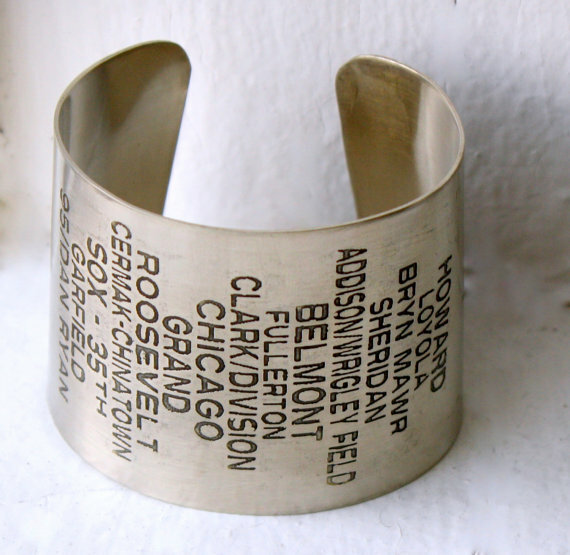 The fugudesigns store on Etsy capitalizes on that with this cool bracelet that shows the stops on Chicago’s Red Line. 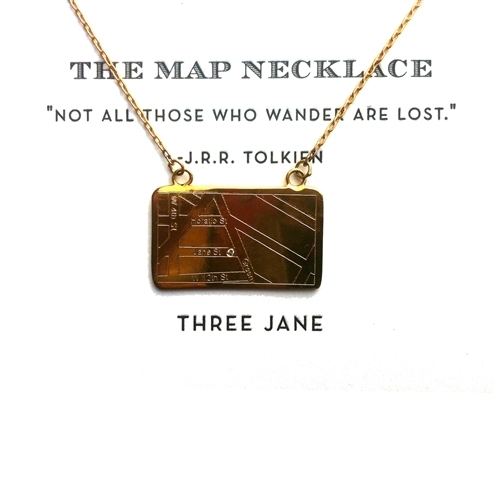 And finally, three jane offers 14K gold necklaces engraved with any location in the world. Use it to celebrate birthplaces, proposals, homesteads, celebrations . . . really, anything would be gorgeous. The back of the gold plate can also be engraved.